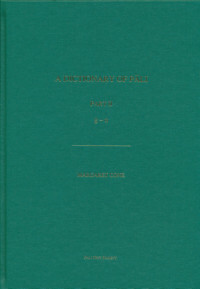 The first volume of a major new dictionary of Pali from the Pali Text Society. This impressive new dictionary has several improvements over the classic Pali Text Society Pali Dictionary, including the use of Pali quotations from the Canon to illustrate the meaning of words, instead of simply references to those passages. This dictionary has two main aims: first, to help its user read and understand the Pali Canon and its commentaries; and second, to provide a picture of the language, syntax, and even grammar of these texts. As of 2012, two volumes have been published: Part I (A-Kh) and Part II (G-N). We have three volumes that have slight cosmetic damage for sale for $90. They can be found here: Dictionary of Pali, Part I, A-Kh (Cosmetic Damage).